Jason Vivieros, Halifax’s Fire Chief, always knew that he wanted to be a Chief. At the TRIAD meeting on Tuesday the Chief told local law enforcement, public safety officials and the Council on Aging, about his journey to the top, and also detailed what’s new at the Halifax Fire Department. State Senator Tom Kennedy was also present to address the new law requiring headlights to be on during inclement weather and at dusk and dawn. Beginning in 1991 Chief Vivieros became a Swansea volunteer firefighter. He enjoyed it greatly, but wanted to make firefighting his full-time career, and to accomplish that he realized we would need further education. The first step, back in the early 1990s, was to attend EMT school. This takes about a year. After finishing EMT school, he chose to attend paramedic school, in 1996. This was a two-year process, and a relatively new concept. It requires classroom training and 400-500 hours of practical training in a hospital ER, Intensive Care Unit, and Operating Room. In 1998 the Chief became a paramedic in Fall River, but his goal was still to be a career firefighter. Finally, in 2001 he became a Sandwich firefighter-paramedic and spent the next few years moving up the ranks to become the EMS manager and finally a Lieutenant, learning valuable management and operations experience. But he still didn’t have his own department to lead. When he came across the open position in Halifax he stated that he was intimidated that Halifax had higher qualifications than most other departments in the state. 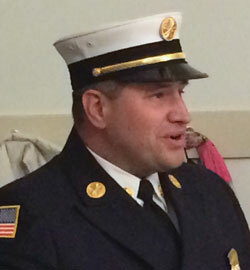 After several rounds of assessment, interviews with selectmen, and other town officials, he was chosen to lead Halifax’s Fire Department and began last August. Chief Vivieros spoke highly of the Halifax Fire department, which has only 8 full time firefighters, which he described as very young, very motivated and highly trained. Training for new firefighters today is intense, and all the full time staff in Halifax are paramedics. They cannot be hired, even as call firefighters, if they are not at least EMTs. All call and full-time firefighters receive on-going training and yearly state testing to maintain their EMT or Paramedic certifications. Finally, Chief Vivieros spoke about a shift in firefighting in Halifax and in general towards prevention. He said that even though people joke about calling 911 for a cat stuck in a tree, that the department will still go out for that call, as it could prevent an accident whereby someone tries to climb a latter and falls– in fact, the department received a call for a cat stuck in a tree just last week. Other examples of “Community Risk Reduction”, as this type of work is now being called, includes doing home assessments, using grant money to help provide smoke detectors, carbon monoxide detectors or even nightlights to seniors. They will even check that house numbering is visible and correct so that no time is wasted during an emergency searching for a house. Another new concept he mentioned is Community Paramedicine, where Paramedics actually go out into the community as allied health professionals to treat patients. Paramedicine is in its infancy in the country, but Chief Vivieros is confident that this will spread rapidly. One has to climb a tall ladder to become the Chief, and Chief Vivieros has made that long climb. • State Senator Tom Kennedy was present to speak about the law he introduced and was recently passed requiring headlights to be on during inclement weather (including fog and snow when visibility is low), when windshield wipers are on, and at dusk and dawn. He stated that he never intended the law to include insurance surcharges, and has introduced an amendment to take out that section of the law. • The Plymouth County Sherriff’s Department Farm will hold its spring celebration from 10-1 on Saturday, May 9th. There will be a plant sale, t-shirts, a K-9 demonstration, and a petting zoo. The farm is located next to the Plymouth Ddistrict court, at 74 Obery Street in Plymouth. • Safety programs for those at risk to wander or fall are available. Contact the Council on Aging at (781) 293-7313. There is a pill-drop center at the Police Station to drop off unused medication.